Starting the weekend we hosted the usual gang with a few new people joining. 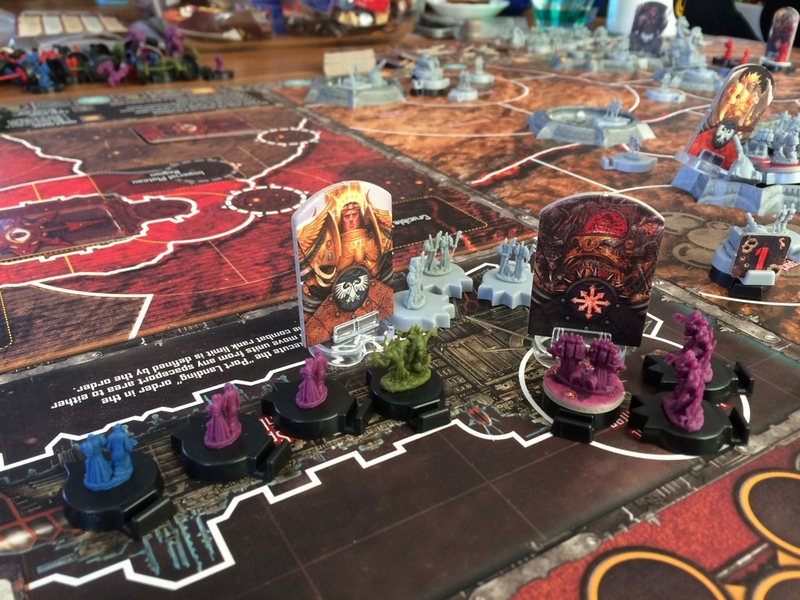 With a quick deployment from previous experience we jumped in to Horus Heresy the Board Game. 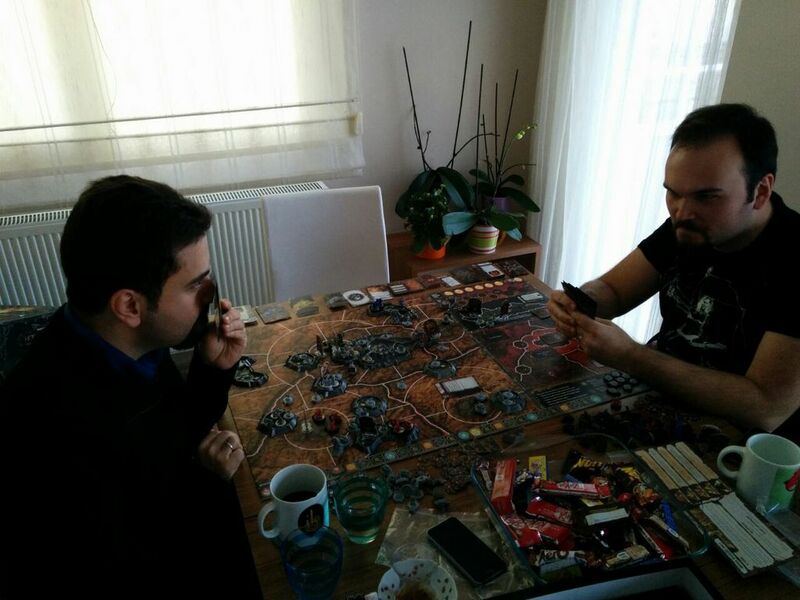 I played the Warmaster’s side while Maverick picked the False Emperor. Horus chilling with some sweet Slaanesh action. The False Emperor, surrounded by the loyal Custodes. 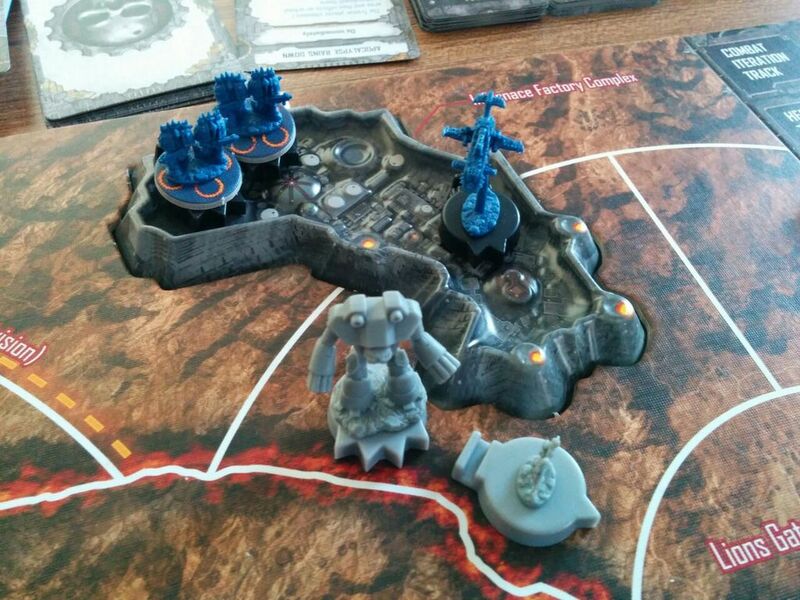 The Traitor player depends on tactical reinforcements. The Loyalists have few reserves but thanks to the Manufactorums they are able to refresh their Titan stock whereas the Traitor armies are limited. Here’s the board after initial setup of the canonical scenario, “Brother Against Brother”. 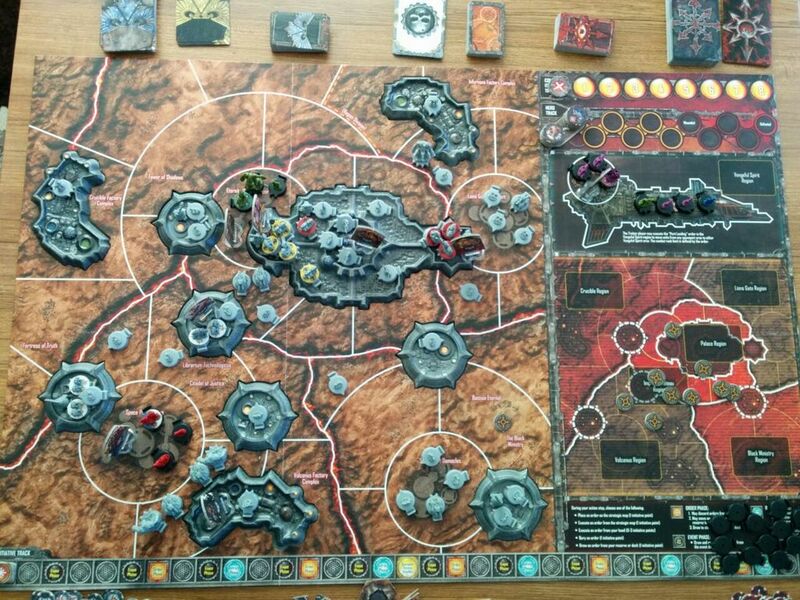 The Loyalists begin with almost all troops deployed, ready for Horus’ arrival on Terra. 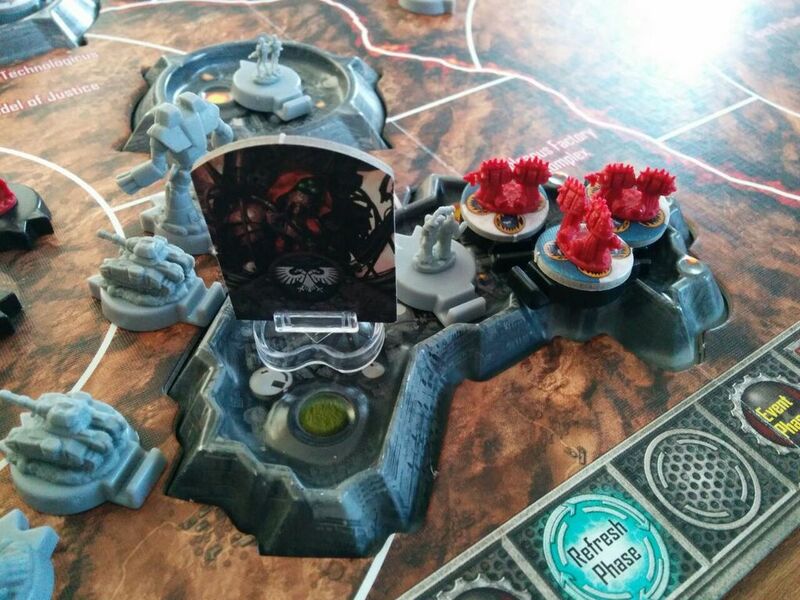 Both sides are in control of two Space ports and the Traitors have the initiative according to the scenario rules. There is a subtle balance: The defenses of the Loyalist side are bare open and the Traitors have air superiority, able to create bombing runs with Thunderhawks but the Chaos forces have to come in waves (if cards permit) and depend heavily upon initial success at converting/destroying units. Angron and Mortarion on the field, surrounded by the Loyal Primarchs, Jaghatai Khan and Rogal Dorn, and the Fabricator General at the start. Horus is in Vengeful Spirit along a few Slaaneshi daemons. The game begins with the Traitor side’s attempt at converting Imperial Guard units and tank divisions to Chaos, at which I managed to secure a good portion (almost all tanks and a few guardsmen) in key locations. Next up, the Traitor player issues bombardment to the field, either precise or reckless, to determine damage to areas. Sadly, all my bombardment attempts failed and the Loyalists stood resolute. Corrupted tank and Imperial Guard (black bases) turn on their brothers, vying for the Space port. 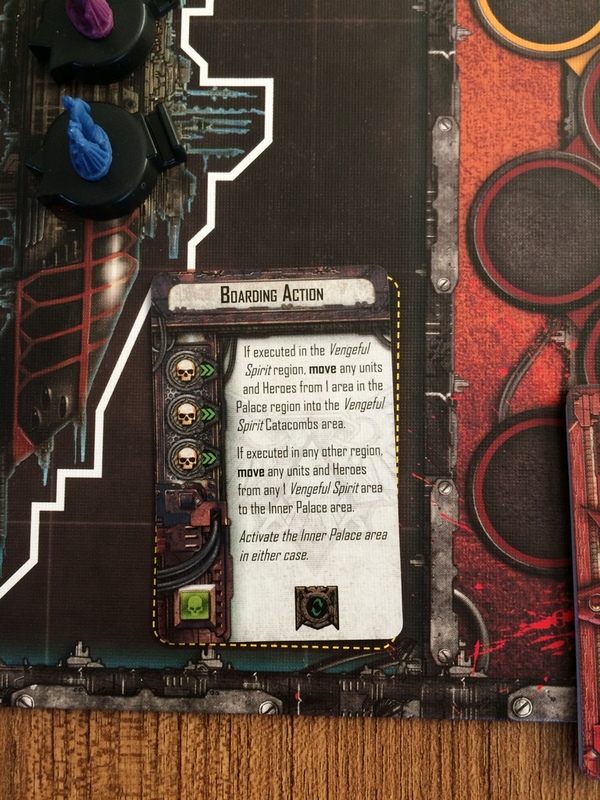 Next up the Traitor player determines landings and drop pod assaults on regions using strategic placement, meaning that at the cost of an initiative point the landings and drops can be activated at a later time. Quite useful. On my turn as a last action I decided to land more troops on some unsuspecting Loyalists, in form of two Thousand Sons Chaos Space Marine troops as well as a Thunderhawk with the drop pod maneuver. Yes, it’s silly to drop pod a Thunderhawk, but go with it. Landed on a spot with one guardsmen unit and naturally, annihilated it. The Titan however will be a different story. 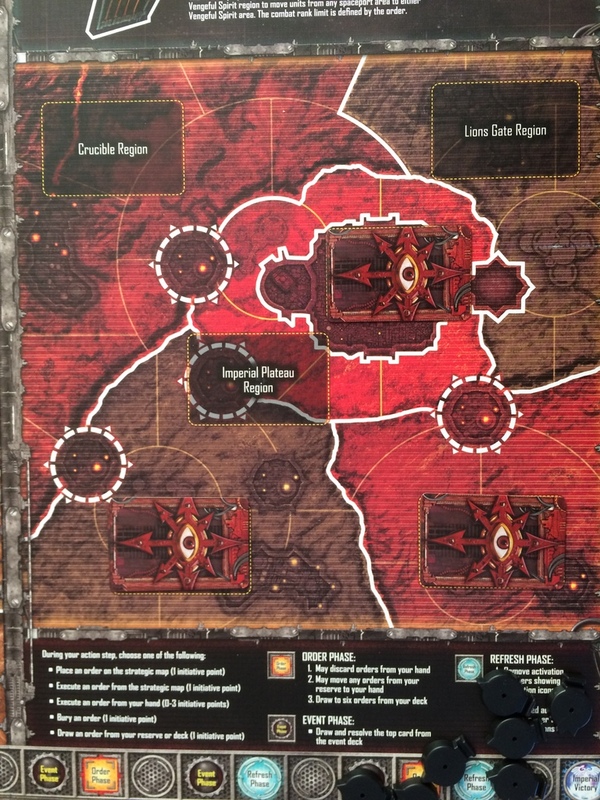 As the initiative passed to Maverick, coexistence battles started, where each sector has to resolve some combat actions where Traitor and Loyalist units… well… coexist. After this, the scum Loyalists came up with a bold move. The Emperor landed on the Catacombs of the ship with his defenders and wiped out all cultists and daemons from the area. 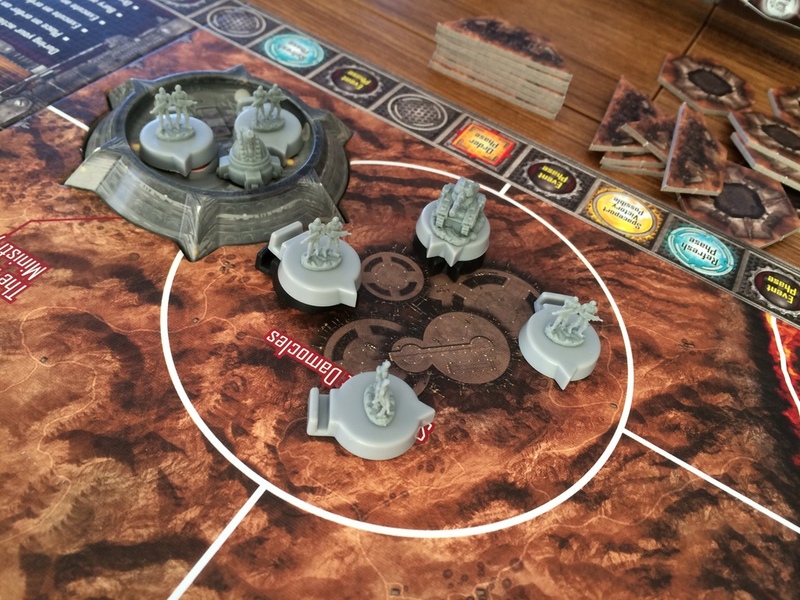 On my turn I deployed some more troops on the field to redirect attention and force a Space Port victory condition, but that didn’t prove too useful. I did get some nice hits on the Fabricator General with my World Eater Chaos Space Marines. Perhaps you should have stayed… in the MOUNTAINS!… of Mars. However, using a clever game mechanic Maverick brought on board Sanguinius with his Blood Angels Troops and assaulted the inner sanctum of the Vengeful Spirit. After a bloody battle, the Warmaster was defeated with the Emperor wounded and Sanguinius alive to tell the story. Not the canonical ending but still fun! The set of combat cards could not be worse for the battle with the Emperor and Horus fell easily. Nerf Sanguinius! Next time Gadget… next time. After a quick refresher with lunch and assorted candy we set out to play Relic, this time with 4 players! Choosing a different end goal and the additional player really made things more fun and ensured that we were hooked on the game for hours. We explained the rules to Ozuguru as he listened intently. We try to understand what Xasf unleashed on the board. Yeah, it gets pretty hectic in Relic. The next day was another good day for me for I met the Figurinistanbul team for a painting workshop. Unfortunately, I do not have any visuals this time, must have gotten caught up in the heat. I did get some goodies from Pegasus however, which I’ll mention in some later posts. Here’s the progress on the Screamers. The assembly is done, they’re ready for primer (they’re just tacked to the stands, but the pose will be pretty much the same as this). Those mould lines were probably the most difficult I’ve encountered to date, worse than Bloodletter fingers! See you on the next post, and have a nice week all! Nice to see horus get kicked down :). Looking forward to the screamer paint! He’ll be back… in black! Seems you’ve changed ID’s over last post. A byproduct of Disqus I wager? I got a surprise brewing for the weekend, I think you will wanna stick around (not to imply you’re not!). I have no idea…it wouldn’t take my wordpress login for some reason so I logged in with google. Silly web.